Charming large woodblock map of the Middle East, including the Arabian Peninsula from the German edition of Munster's "Cosmography". 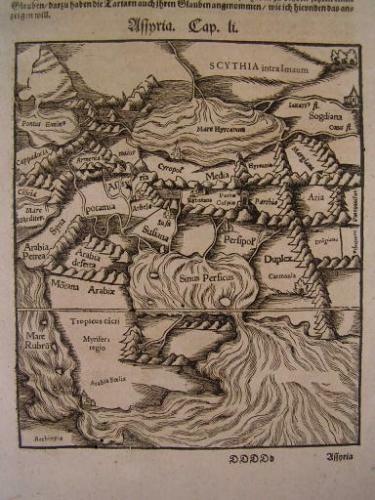 This leaf originally appeared in the 17th century German re-issue of this landmark 16th century work, which was one of the earliest attempts in Europe to systematically and accurately organize, describe and depict the entire world as it was then known. It is encyclopedic in nature and scope, and discusses the various cultures, topography and history for all parts of the world -- much of it speculative and wildly inaccurate. It should be pointed out that Munster was writing this book only some 50 year or so after Columbus discovered the Americas, and thus captures the world through the eyes of this Renaissance/ early modern Europe era.